No, it's not a misspelling! I mean baroque as in the artistic style that focuses on bold curving forms and elaborate ornamentation. This perfectly describes the Anthropologie Gilded Estate skirt which I wore today. I love the intricate baroque pattern on this skirt, rich blue hue, and sleek pencil skirt silhouette. The skirt is designed by Yoana Baraschi and was on sale for 69.95, plus last month's birthday discount. For that price you can look baroque without going broke! 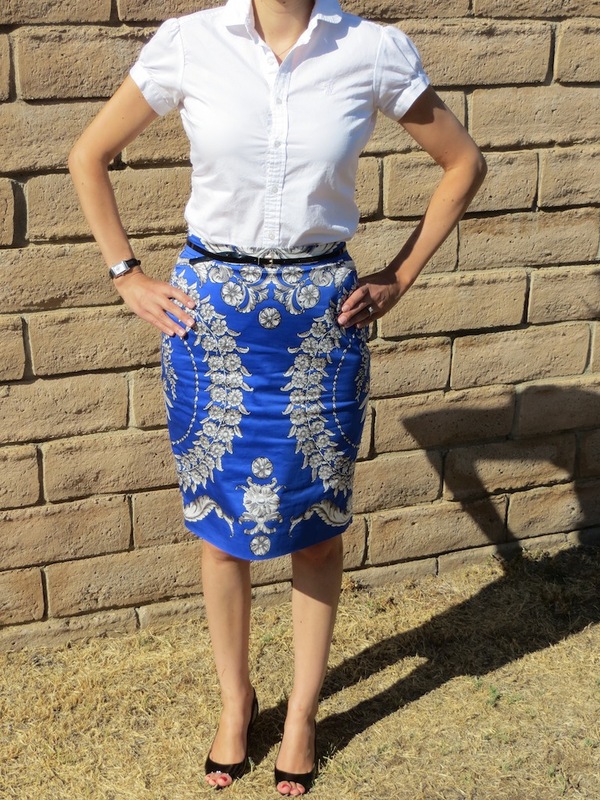 I paired this skirt with my white Ralph Lauren blouse and J. Crew Drea patent leather pumps. I bought these pumps for work when they were on sale last spring at J. Crew. They were a part of my epic buy of made in Italy shoes from J. Crew. I think they cost a mere $50, which isn't bad for Italian craftsmanship. I added a belt to the skirt for a more "polished" look, which, surprise, surprise, is also from J. Crew. I am happy that J. Crew is still making their belts (some of them) in the United States. I try to buy these belts whenever possible to support the U.S. and American made goods. Here is a close up of the belt and the rich baroque pattern of my skirt. 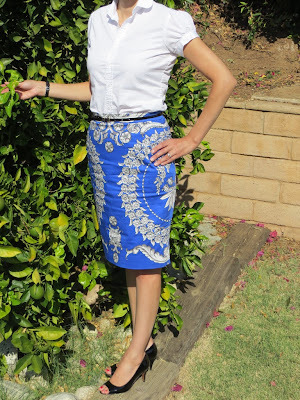 I've read from other bloggers that this skirt runs a little small to tts for anthro sizing. I am a size 2 in J. Crew, but I also have a lot of stuff that is a size 0 from J. Crew too. I am usually a 4 in anthro skirts as I find that there stuff runs a little smaller than J. Crew. Therefore, I would say try both the 0 and 2 if possible. Since you are petite phiphi, the 0 might be fine. Also this skirt has some stretch to it, which is something to consider. Hope this helps!